ROCK SPRINGS — Ian Vaske slowly raises a 40-foot by 8-foot metal container with a bi-fold swing-away from a 2008 Grove 225-ton crane. Vaske slightly turns it toward the auto shop classroom next to the west parking lot at Rock Springs High School where the container gently descends toward its destination. 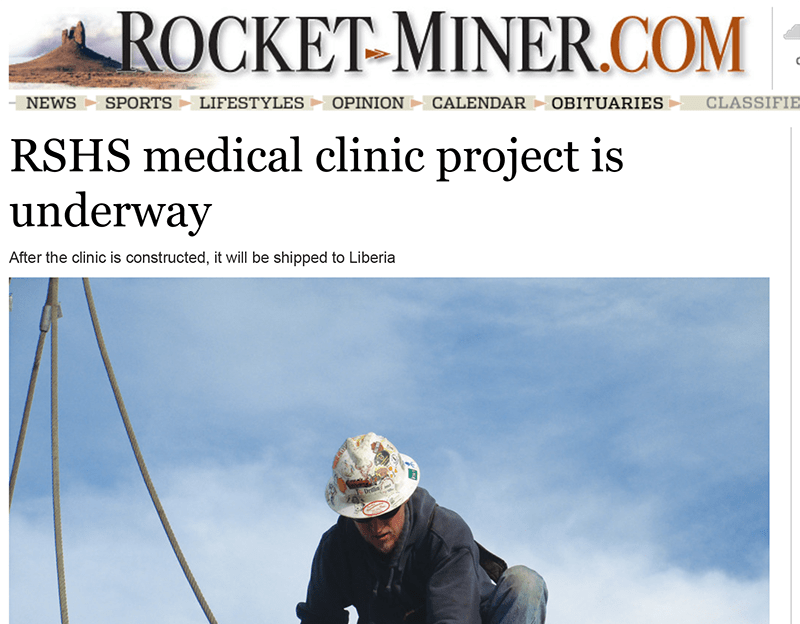 The landing makes it official, Rock Springs High School has reached the next stage in constructing a medical clinic which will be donated and shipped to Liberia. The project is sponsored by Homes of Living Hope, which helps underserved communities around the world by partnering with volunteer groups across the country to build and ship functioning facilities to partnering aid groups in communities throughout the world. The design portion of the project began prior to the delivery of the container. Once construction is complete, the school will request medical supplies from the community. After that, the container and everything inside will be transferred to Homes of Living Hope, which will then send it by rail to Houston. From there, it will be shipped to Liberia where it will be used to help set up the clinic. The container was a gift from the community. John Bunning Transfer Co. Inc. donated the use of the crane while Linde Engineering bought the container and gave it to Simplot Phosphates. Simplot has held onto it since the beginning of the school year. “It’s been sitting for eight months. Kind of lucky they didn’t haul it away,” said Mike Prevedel, Simplot project manager. Dr. Mosoka Fallah, a Harvard graduate who is returning to Liberia, has been working to get a clinic to a recently discovered village called Nyenma in Montserrado County, which saw 90 percent of its population die from Ebola. The village has agreed to add a brick building with the clinic. A zinc roof will be built over both buildings to create a waiting area. The clinic will begin operating two to three days a week and will train community health workers. “We are very excited about this project and the impact it will make on the students and recipients of the clinic,” said Bart Wear, Homes of Living Hope co-founder.